Why am I getting this iTunes Sync Error "Some of items ... could not be found"? 1. 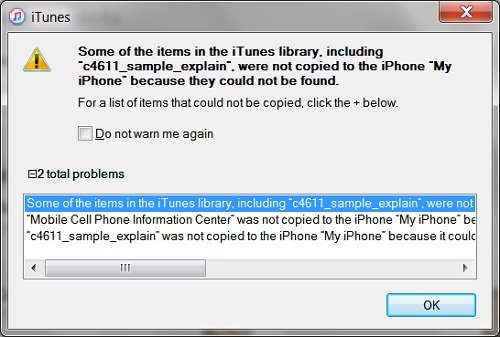 Add the "4611_sample_explain.pdf" book to iTunes library from c:\fyicenter. 2. Delete the file c:\fyicenter\4611_sample_explain.pdf. 3. View book library on iTunes. The book is still listed in the library. because they could not be found.